At the end of 2017, 15 individuals took part in an innovative 10 week awareness-raising programme funded by their trade union and designed to provide the skills and confidence to tackle racism. 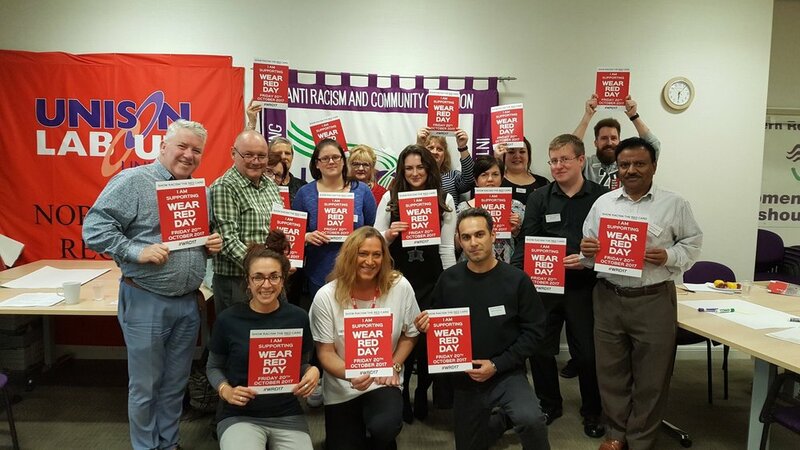 The Northern UNISON members travelled from across the North East on a weekly basis to access the programme which is based on Show Racism the Red Card’s 22 year experience of educating and campaign against racism. Each week, the participants took part in a two hour workshop or event delivered wither by Show Racism the Red Card staff or specialist guest speakers from across the region. By using open, participatory and creative methods, participants were provided with the opportunity to develop skills such as assertiveness, communication, leadership, critical thinking and public speaking. Developed critical thinking skills and will be more confident in constructing reasonable arguments. A better understanding of their own feelings, beliefs and values and how to manage and communicate them effectively. More knowledge of how to engage, participate in and hold to account the political system. Increased awareness around issues of Immigration, Extremism, Islam, Stereotypes and media’s role in our perception of these. A clear understanding of what racism is, how it impacts on individuals (targets and perpetrators) and society and how to more effectively challenge it within the workplace and community. An increased understanding of anti racism and community activism and be more likely to be involved in initiatives. Session 2 (2 hours) Introductory session 2: How will we go about our learning? • Become more aware of the impact of prejudice towards GRT groups on daily life and the extent to which this affects communities. 'What is your activism going to look like ? Throughout the project, participants were tasked with completing reflection journals and we given a variety of thematic homework tasks to extend their learning and prepare them for the forth coming sessions. The programme culminated with each participant delivering a 5 minute presentation describing their personal journey and answering the question ‘What is your activism going to look like?’. Show Racism the Red Card staff were inspired by the content of these presentations and the passion and insight with which they were delivered; they truly demonstrated the skills and confidence amassed by the participants through participation in the programme and were testament to the commitment shown by all of those who took part. The programme has created another 15 driven and dedicated anti-racism champions prepared to challenge racism in the workplace and in their local communities with the commitment, knowledge and understanding required. All of the participants from the 2017 SRtRC/Unison Ambassadors programmes said that the course had 100% met their expectations, and all said that they would have no hesitation in recommending the course to others. On a scale from very poor to excellent, over 80% of the participants rated the course as excellent and over 15% said very good. All of the participants said that their awareness of issues such as immigration, Islam and the far-right had improved, and over 80% said that they now rate their political awareness at now moderately and extremely aware. All of the participants said that they now felt highly and moderately confident with responding to racism in the workplace and the wider community following their participation on the programme. Following the course, over 80% of the participants felt that they where aware of Unison, and the work that they do. 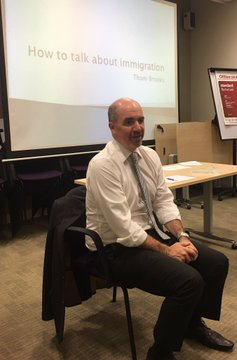 All of the participants said that they would likely or extremely likely now get involved with a UNISON campaign/initiative, and all said with varying degrees that they would be comfortable in volunteering to publicly speak at a UNISON event. Over 15% said that they would be very comfortable in doing this.